The right time to take a newborn photography session is within 15 days after the baby is born. To secure your desired session time, please contact me as soon as you can. I add a tentative date around your due date onto my calendar upon booking. Once baby arrives, you will then contact me to schedule your session. My baby is already born, is it too late to schedule? Not at all! 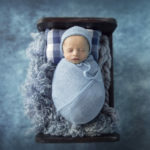 Most newborn sessions are booked many months in advance. 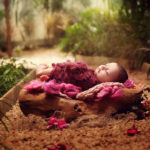 However, given the necessarily fluid nature of scheduling newborn sessions, there may be spots available at short notice. 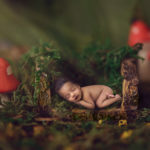 While I recommend that newborn sessions take place during the first two weeks of life, I am always happy to photograph older newborns with the understanding that it may not be possible to achieve pose the newborn in the same poses as a younger newborn, since older newborns tend to be more alert and less flexible. Newborn sessions are anywhere from two to four hours long. It may also get longer. Try to keep your newborn awake for an hour prior to the session and plan to feed your baby just prior to the shoot. If you are nursing, it is best to keep a bottle of expressed milk on hand for use during the session. Pacifiers are also extremely helpful for allowing me to calm your baby during the session. Should I bring any Props? All props are provided, but please let me know few days prior to your session if you have any personal items(ideas) you’d like to incorporate ! Yes, depending on the package you request, I will aim to capture images of newborns with their parents and siblings. Please keep in mind that young siblings (under 4) may not want be photographed alone with their new brother or sister. I will do my best to capture images of your newborn with their toddler or pre-school aged sibling. I use both Natural light and studio lights. What If I need an image for a Birth Announcement? Rush editing is available at a charge of ₹1000. A rush image will be presented in 4-5 days from the session date. How long will I wait for the Final Gallery? Client galleries are available for review/download approximately three- four weeks after the session. You will receive according to the package you have selected. I understand it seems a little odd to go through a photoshoot and hear so many clicks, and then receive fewer images. During a photoshoot, I’m making real-time adjustments to lighting to create the perfect shot. I’m also occasionally firing “burst” of shots to ensure that I get an image with no eyeblinks, and to make sure we don’t get any shots of a person starting to talk or brushing their hair out of their face. It’s necessary to take these images, they are part of the working process of art, just as a painter sometimes tries a few colors before making the final stroke. All images are captured in a raw color format, so the image-making process is not finished, even when the shoot is over.